The heartbeat of Memphis echoes throughout the soundtrack of Little Town of Bethlehem. This past October, EGM brought both music and movie to the 2011 Gandhi-King Conference on Peacemaking. Memphis native Kirk Whalum opened the evening with a soulful performance before conference attendees—a diverse mix of activists, academics, and community leaders united in their commitment to peace and nonviolence. The passionate offerings of this Grammy-winning recording artist, saxophonist, and ordained minister set the tone for an equally stirring “conversation” with Clayborne Carson, professor of history at Stanford University and the founding director of the Martin Luther King, Jr. Research and Education Institute. By eight o’clock, houselights in Christian Brothers University’s theater had dimmed and the haunting strains of a blues harmonica rose from Manger Square’s center. Little Town of Bethlehem is rolling. 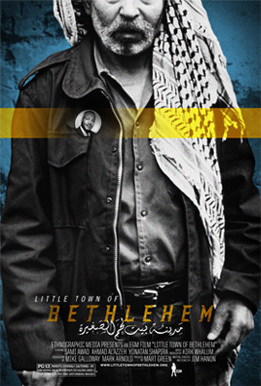 Naturally, the film’s score is very familiar to Kirk Whalum—he produced it, blending the music of Israeli and Palestinian artists with blues musicians from his hometown. The three-day conference culminated with a closing ceremony at the National Civil Rights Museum—the very site of Dr. King’s assassination. While a cold rain moved activities indoors, it didn’t seem to dampen anyone’s spirit. In fact, a march organized by a large group of Occupy Memphis protesters actually culminated at the Museum as we gathered for the ceremony. Kirk Whalum once again captured the moment with his moving interpretation of “Amazing Grace.” Conference host Jacob Flowers then joined EthnoGraphic Media president Bill Oechsler for a presentation of a wreath. Its white sash read, “May the path to peace start here.” As Whalum played “We Shall Overcome,” the entrance hall filled with the hopeful voices of those who gathered. Some of you are true visionaries of nonviolence and social change. Many of you are community leaders, academics, organizers, and activists. All of you are peacemakers. The theme of this year’s conference is A Living Moment. It carries a reminder to make today—every day—matter. “Make your life your message,” Mahatma Gandhi encouraged. “Whatever affects any one of us affects all of us,” Dr. Martin Luther King preached. Every day our individual words and actions are mutually linked. So how can we serve a higher purpose for a greater good—every day?